Hunters urged to avoid shooting lethargic or sick deer. Pennsylvania Game Commission officials confirmed on Friday that a wild deer and a captive deer in Northampton County had epizootic hemorrhagic disease. Both animals were found in the same vicinity. 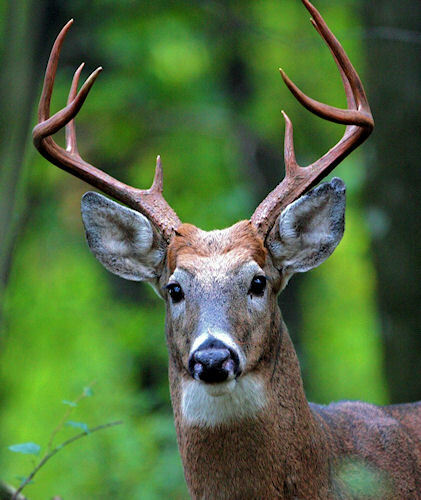 Pennsylvania residents are encouraged to call their respective Game Commission region office to report dead or sick deer. If you need contact information, you can find it on the agency's website: www.pgc.state.pa.us. Click on "About Us" in the menu bar at the top of the page, then select "Regional Information." To provide the public with more information about EHD, the agency has posted an EHD information page on its website www.pgc.state.pa.us ). To view the information, place your cursor over "Wildlife" in the menu bar at the top of the page, then put your cursor over "Wildlife Diseases" in the drop-down menu listing and then click on "Epizootic Hemorrhagic Disease". EHD is a common, but sporadic disease in white-tailed deer and is contracted by the bite of "biting midges" and isn't spread from deer to deer contact. In more northern states, such as Pennsylvania, EHD occurs less often. The virus usually kills the deer within five to 10 days. "Reports of dead or dying deer are important to us," says Doug Killough, Game Commission Southeast Region Office director. "Though an actual count of afflicted deer is impossible to obtain, because of rapid decomposition and the area where the outbreak is occurring, we still value these reports. "Also, tissue samples must be extracted within 24 hours of death to be suitable for conducting tests. That's why it's so important that we hear from residents as soon as possible after they find a suspect deer." Humans are not at risk from EHD. But other diseases could be transmitted by careless hygiene when processing deer. The Game Commission always recommends hunters avoid shooting or consuming deer that appear ill.
"Even though some EHD symptoms are similar to those of chronic wasting disease – excessive drooling, weakness and a loss of fear of humans, there's no relationship between EHD and CWD. However, because these diseases coexist, deer submitted for EHD testing also are being tested for CWD." The EHD mortality rate can be amplified by anything that serves to congregate deer, such as supplemental feeding, and placement of salt or mineral blocks. Incidences tend to be reduced when ample rainfall spreads browsing animals out. Outbreaks tend to stop after the first hard frost. Localized outbreaks have occurred in the past in Pennsylvania. They were confirmed in 2002 and 2007, and suspected in 1996.